The pair of November primetime games mark the first time the Nittany Lions will play a night game in the month of November since visiting Pittsburgh on November 14, 1987. All three of the matchups between the Nittany Lions and Scarlet Knights as Big Ten Conference foes have been played in primetime. Four of Penn State’s last five games against the Hawkeyes have been played under the lights, including the 2009 contest at Beaver Stadium. It was previously announced that for the fifth consecutive season, Penn State and Ohio State will meet under the lights on ABC, ESPN or ESPN2. 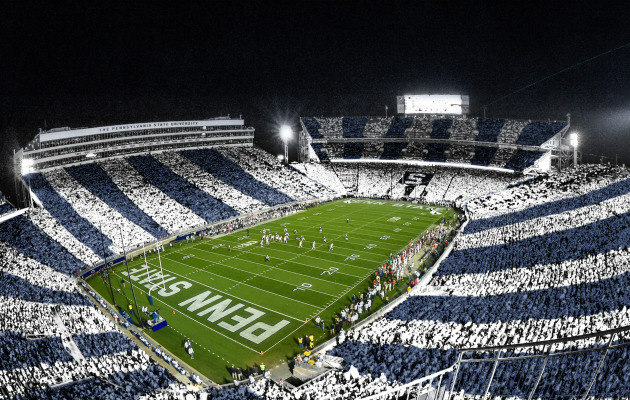 The teams will square off in the annual Penn State White Out game at Beaver Stadium at 8 p.m. on Saturday, Oct. 22. Penn State and Iowa square off for the first time since the 2012 season when the Nittany Lions earned a 38-14 win in Iowa City. Bill Belton ran for 103 yards and three touchdowns, while Matt McGloin threw for 289 yards and a pair of scores. Jesse James and Allen Robinson had the receiving touchdowns for Penn State. The win was the first for the Nittany Lions in Iowa City since 1999. 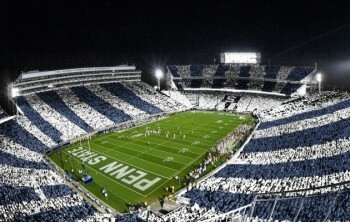 The Nittany Lions hosted the Scarlet Knights in the inaugural Stripe Out of Beaver Stadium last season. Running back Saquon Barkley ran for 195 yards and two touchdowns, while fellow tailback Akeel Lynch also reached the 100-yard mark with 120 yards and a score. Barkley’s 195 yards were the most by a Penn State true freshman since 1998. Safety Marcus Allen led the defensive charge with 11 tackles, while Jordan Lucas and Brandon Bell had nine stops apiece. Penn State will play at least one regular season night game for the 17th consecutive season. Every Penn State football game has been televised the past 11 seasons and 275 of the last 277 contests overall have been on TV. In addition to the television arrangements, Penn State’s games will also be available on the Penn State Sports Network and GoPSUsports.com. The Nittany Lions return 40 lettermen and 16 starters from last year’s TaxSlayer Bowl squad, led by Freshman All-American running back Saquon Barkley and All-Big Ten honorees Chris Godwin, DaeSean Hamilton, Jason Cabinda, Marcus Allen and Grant Haley. Barkley rushed for a Penn State freshman record 1,076 yards last season on the way to earning Freshman All-America accolades and All-Big Ten second team honors. Godwin became just the third player in program history to register 1,000 receiving yards in a season with 1,101 yards on 69 catches. He was also an All-Big Ten second team choice by the media and third team selection by the coaches. Hamilton earned All-Big Ten honors for the second-straight season with an honorable mention pick in 2015. Cabinda was honorable mention All-Big Ten after collecting 100 tackles last season to lead the team and rank 15th in the conference. Allen was second on the team with 81 tackles in 12 games a year ago. He also forced a pair of fumbles en route to All-Big Ten honorable mention accolades. Haley was named All-Big Ten honorable mention after leading the team with nine passes defended and made 42 tackles. The Nittany Lions open the 2016 campaign against Kent State at Beaver Stadium on Saturday, September 3. Season tickets for the 2016 campaign, which includes five Big Ten home games for the first time are on sale, with nearly 3,000 new season tickets having been sold. There will not be any increase in the price of Penn State football season tickets or Nittany Lion Club donation levels for next season. For information on joining the Nittany Lion Club and purchasing new 2016 season tickets, as well as club seating in Beaver Stadium, fans can visit www.PSUnrivaled.com, call 1-800-NITTANY weekdays from 8 a.m.-5 p.m. or visit the Bryce Jordan Center ticket office weekdays from 10 a.m-6 p.m.